A printable calming strategies toolkit designed to grow with your child! Helping your kids learn self-regulation skills has been proven over and over to be beneficial. 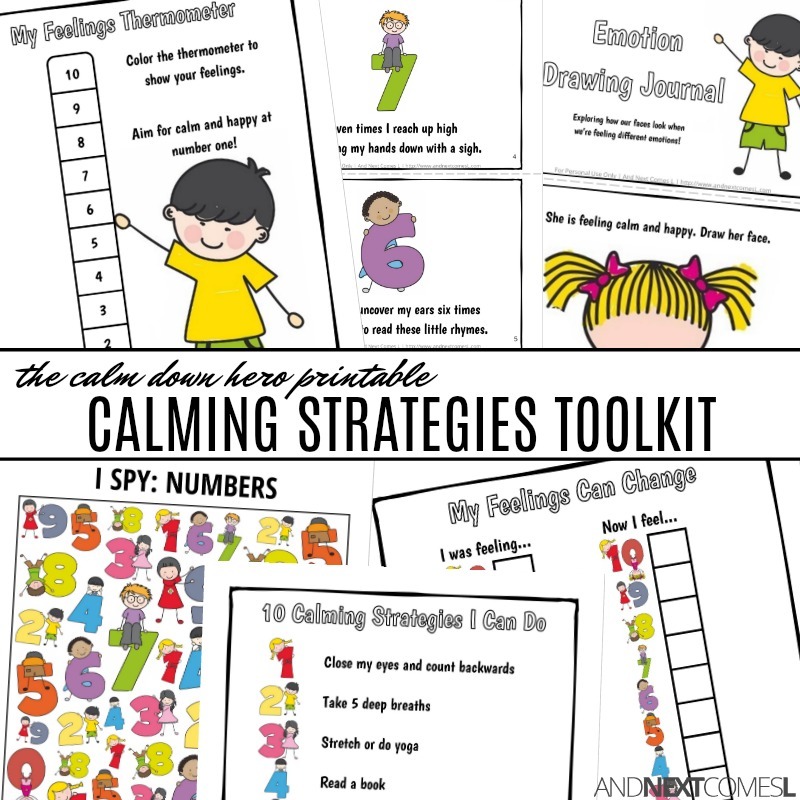 This printable calming strategies toolkit is the perfect way to help kids explore their emotions, develop self-regulation and coping skills, manage and reflect on their emotions, identify their emotions, and more as they grow. $15 US | BUY NOW! I Am a Calm Down Hero Calming Strategies Story - A story that teaches kids a variety of calming strategies as they count their way backwards from ten to zero. Calming Strategies Workbook - This workbook allows kids to reflect on how they managed their big emotions, explore their ideal coping strategies, and more! Journal Prompts - These prompts will have the kids writing about their different emotions. Feelings Chart - The kids can decorate and label their own feelings chart and then use it to rate their feelings on a scale of one to five. Numbers Coloring Book - Coloring is a great way to reduce anxiety and stress! Emotion Drawing Book - A great way to practice identifying and exploring emotions, as well as concepts like pronouns. 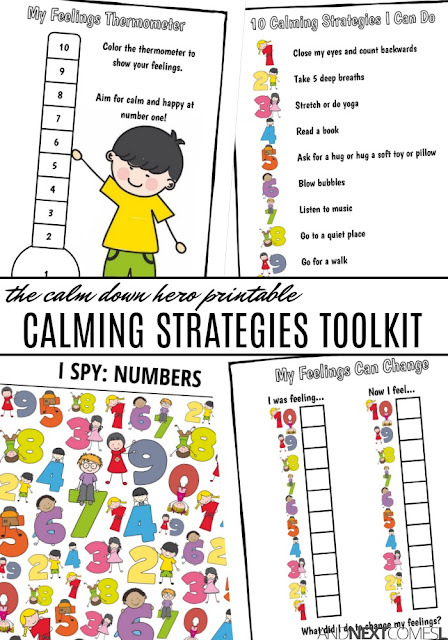 Calm Down Hero Posters x 6 - Hang them up in your classroom or your child's bedroom to encourage them to be a calm down hero on their own. I Spy Game - A perfect game to include in a calm down kit. Matching Game - Another game to include in a calm down kit. Positive Affirmations Coloring Book - Let your kids color and put together their own book of positive affirmations that will empower them to be their own calm down hero. They can pick the affirmations that suit them best and assemble their book accordingly.